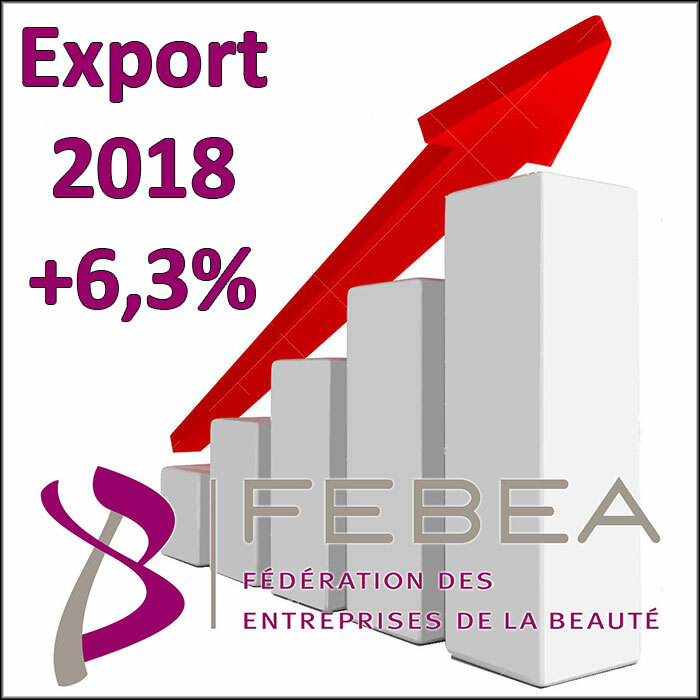 According to a press release from the FEBEA (Federation of Beauty Companies), French cosmetics exports surpassed the 14.5 billion euro mark in 2018 (+6.3% compared to 2017). The sector has a positive trade balance of €11.2 billion, up almost 6.6% compared to 2017. The sector maintains its position on the podium of French exports after aeronautics and wines and spirits. The value of exports once again exceeds the sector’s turnover on the French market. In the European Union, export growth remains strong with an increase of 4.5%. The largest increases were in Spain (+8.5%) and Italy (+7.2%). The outcome of the Brexit negotiations is highly anticipated by the sector since the United Kingdom is the second largest EU country (after Germany) to which France exports the most (over €1 billion with a 3% increase). Outside the EU, Russia’s growth was 17.8%. “Although Europe is already a mature market, and French products are already very present there, the attractiveness and safety of French products still make it possible to increase exports,” according to the FEBEA press release. Exports to Asia continue to grow, with an increase of 16.6% in 2018 and growth of over 20% in China (+22.7%) and Singapore (+24%). More than 20% of French products now go to Asia, representing more than €2.6 billion. North America posted a 6.8% increase in exports, with a 5.7% increase in the United States. This country remains the second largest destination for our global exports. South and Central America remained stable. For the Near and Middle East region, a slight decline of 2.1% in exports occurred (Saudi Arabia recorded a decline of 6.2%), closely linked to the change in oil prices. For the Africa region, the situation is mixed: West Africa is up with +16.8%, Central and Southern Africa is down by 6.8%. North Africa also fell (-3.7%), mainly due to a blockage of imports by Algeria. Care products and perfumes still represent ¾ of French cosmetics exports: 45% for care products and 22% for perfumes respectively. “French cosmetics continues to play a leading role throughout the world. Admired for its excellence, it is innovating more than ever to meet new consumer well-being demands: on formulation quality and safety, product personalization and environmental commitment,” says Patrick O’Quin, President of the Federation of Beauty Companies (FEBEA).